England flanker Tom Croft has been ruled out of the bulk of this year's Six Nations after scans confirmed he suffered a medial cruciate ligament injury on Saturday. Croft limped out of Leicester's recent Heineken Cup victory over Viadana after just 27 minutes and now faces five to six weeks on the sidelines. As a result the 24-year-old is set to miss England's opening three matches against Wales, Italy and Ireland, and faces a battle to prove his fitness ahead of the match against Scotland at Murrayfield on March 13. A statement from the Rugby Football Union last night read, "A scan has confirmed that Tom Croft sustained a grade two medial cruciate ligament injury to his left knee in the Heineken Cup game against Viadana last weekend. He has now started his rehabilitation programme with a view to returning to action in five to six weeks." Croft cemented his place in the England set-up during the 2009 Six Nations and was later handed a call-up to the British & Irish Lions squad for their trip to South Africa after Munster's Alan Quinlan was ruled out by suspension. A sparkling run of form, including a try against the Golden Lions, saw him rewarded with a place in the side for the 1st Test against the Springboks where he scored two more tries. He retained his spot in the England squad for the end of year internationals and was shortlisted for the International Rugby Board's Player of the Year award but was struck down by a knee injury in December that ruled him out of action for six weeks. 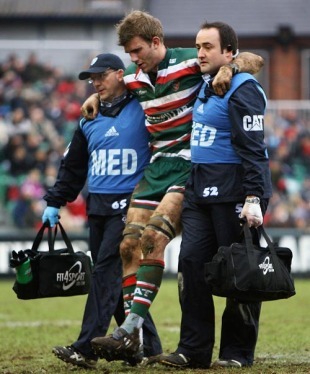 And it is a recurrence of that injury - suffered in only his second game back - that has now ruined his Six Nations hopes.